The Zangi Delfino (i.e. 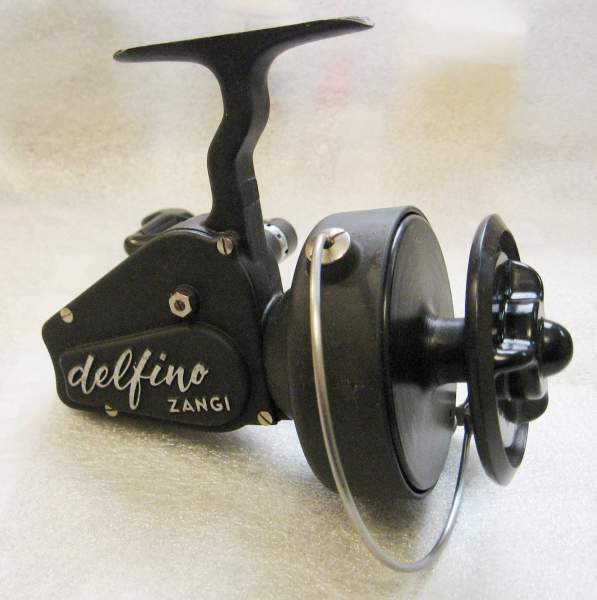 Dolphin) is a very large surf size reel and was Zangi of Italy's first heavy duty salt water model. 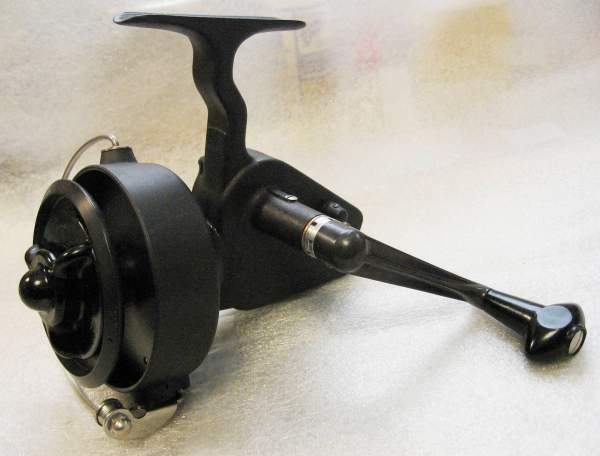 This brute weighs in at 24 oz with no line, has a 3.2:1 gear ratio and will hold 520 yds of 10#, or 300 yds of 20#, mono. It was distributed by Horrocks-Ibbotson of Utica, NY and was advertised in 1957 at a price of $46.20. A week or so ago I opened up this old Delfino and found it full of ooh & goo! I could tell I was in for quite a fun filled ordeal. That stuff was so sticky I had to scrape it out one screwdriver blade width at a time. I wiped off as much old grease as I could with a rag before putting the unpainted metal parts in my lacquer thinner jar. The body had so much goo & hard grease in it I had to wash it, the side plate and rotor with Xylol before I did my normal Original White Goop & warm water Dawn washes. I used Xylol because it doesn't remove the paint or anodizing. 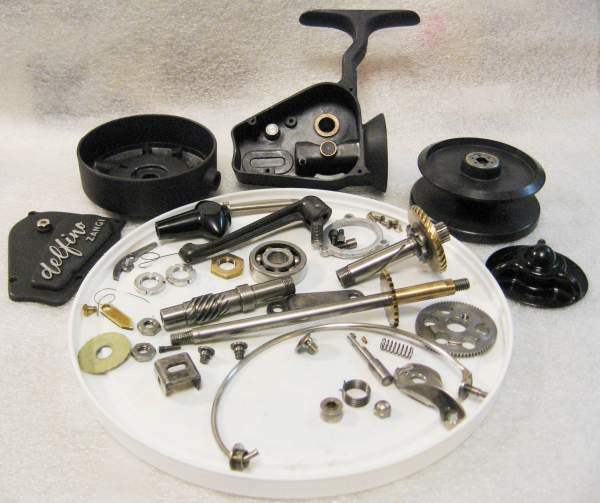 After a couple of days soaking, good cleaning and buffing here are all the parts ready to reassemble. I started with the spool click. This thing has one heavy duty brass dog & hefty spring. As usual, before my hands get greasy I install the bail trip, bail spring and bail arm. 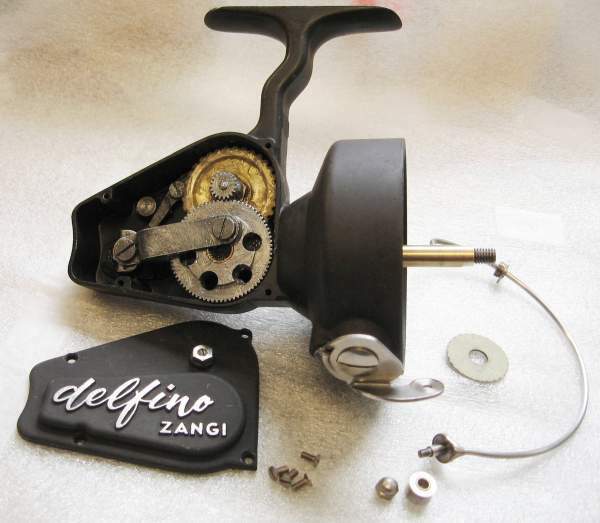 Surprisingly, Zangi only uses one bail spring in their reels. I use ArmorAll as a lubricant in these locations because it stays slick and doesn't collect dirt & grime. Zangi often used a plunger type rod as a bail trip. 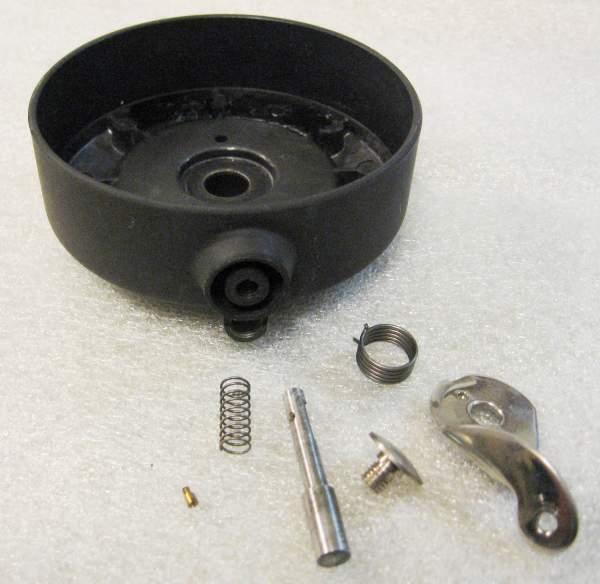 The rod slides inside a spring in a tube in the rotor and is retained in the tube by that tiny brass screw. That's one you sure don't want to lose! After the bail trip & bail arm are installed I'll check the bail for perfect alignment and bend or adjust it where necessary. I usually install the bail now but because of its size & attachment simplicity I’ll wait until later. You can see the brass plunger retention screw in this photo. I start the body assembly with the anti-reverse pivot & knob. 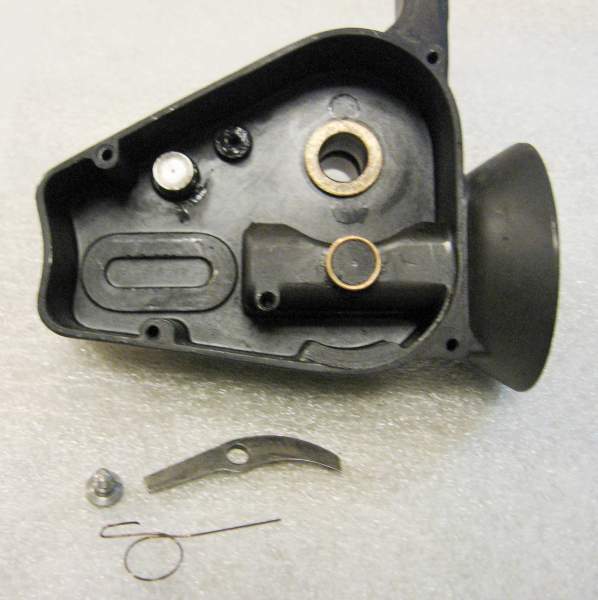 A small spring washer goes between the pivot and body. The knob is retained by a tiny screw. 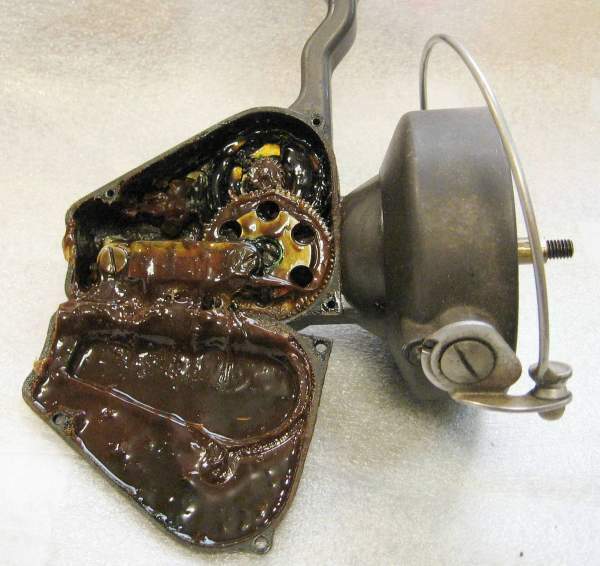 All the internal parts get lubed with Super Lube grease and synthetic oil. I grease every screw hole for easier removal down the road. Next I install the anti-reverse dog. Notice how large and heavy duty the dog is. It has a hefty spring, too. It's time to install the pinion worm gear and bearing. 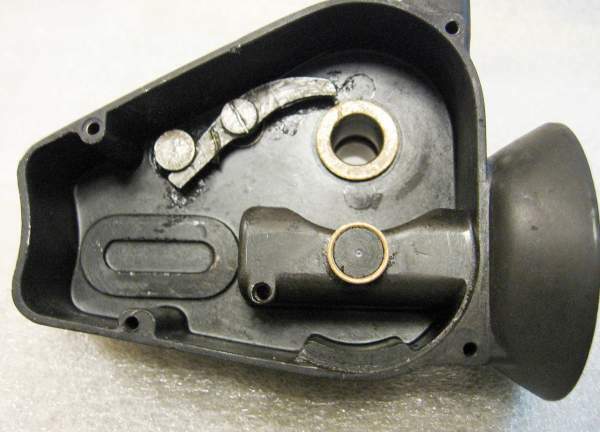 The pinion rides in a removable oilite bushing at the rear of the housing. The bushing is already installed. 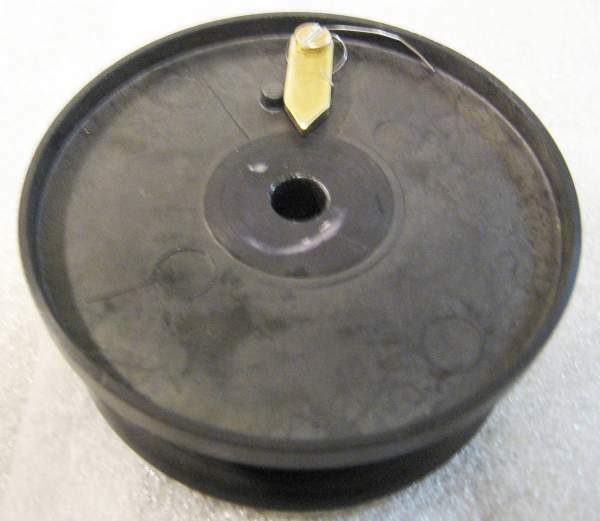 The small pin screw fits in a groove in the oilite to hold it in place once the pinion is installed. The ball bearing is open on both sides. I prefer slower greased lubricated ball bearings so I first oil the balls & races with synthetic oil, fill the bearing with Super Lube grease and then add a little more oil to thin the grease. 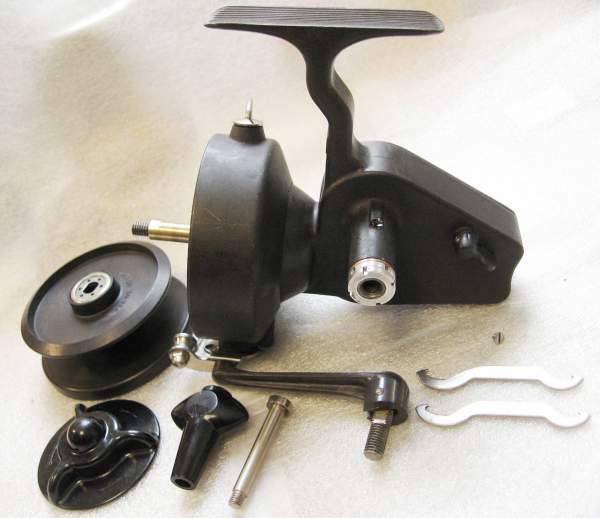 The bearing retainer has three bolts and the heads double as bail trip studs. This is quite different than most reels. The bail will trip in three different locations. Here is an interesting design. The oscillation shaft and main gear shaft have spiral grooves milled into them, kind of like rifling. That’s a good idea for smoothness and dispersing lubrication. You can also see the three bail trip studs on the bearing retainer. Notice the diameters of the oscillation shaft and main gear shaft! 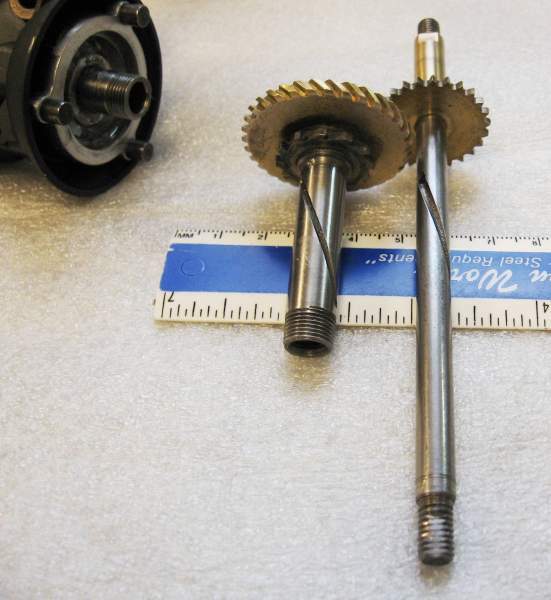 The oscillation shaft is 5/16" & the main gear shaft is almost 7/16". 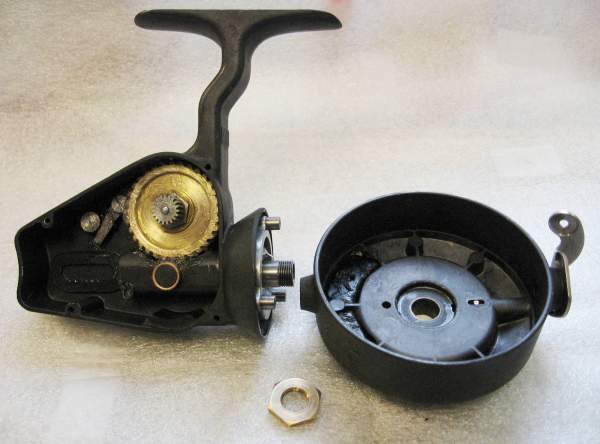 No wonder the reel weighs a pound and a half. It’s now time to slip in the main gear, snug up the locking nuts and install the rotor. 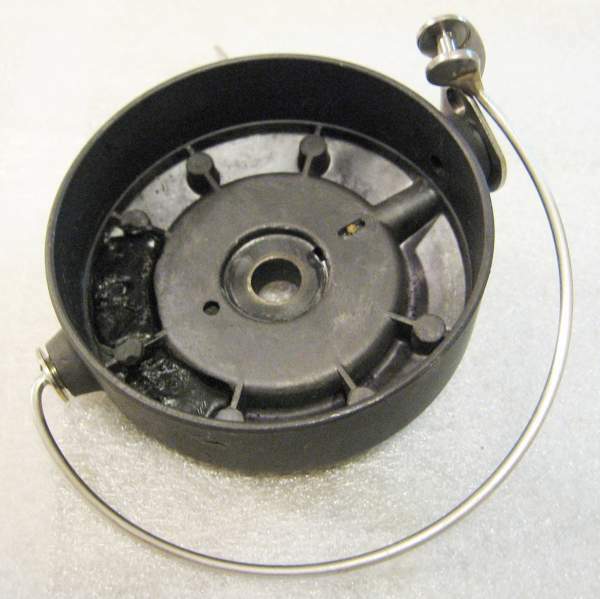 The rotor nut, like most Zangi made reels, is reverse thread, i.e. lefty tighten. Many an unknowing reel tech has cracked one of those brass reverse thread nuts and they're near impossible to find. It doesn't take much wrong way torque to break them. Buying a tap and making a new one is about the only alternative. 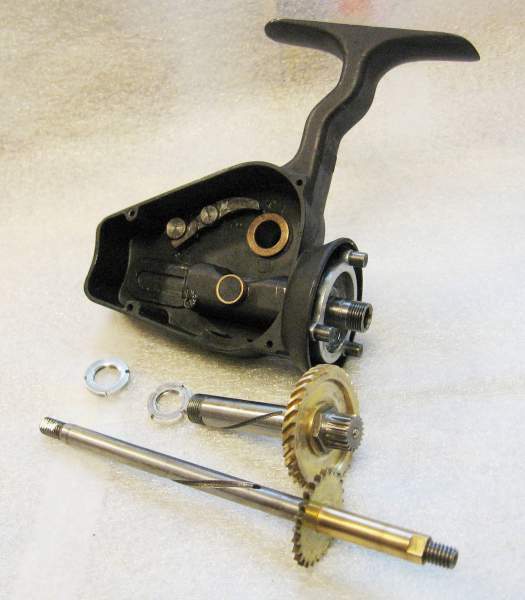 Also, notice the small gear teeth on the main gear and the oilite busing on the pinion housing. These are for a stout oscillation gear. Now the main shaft and oscillation gear get installed. Like I said earlier, all the internal parts get greased with Super Lube & synthetic oil. 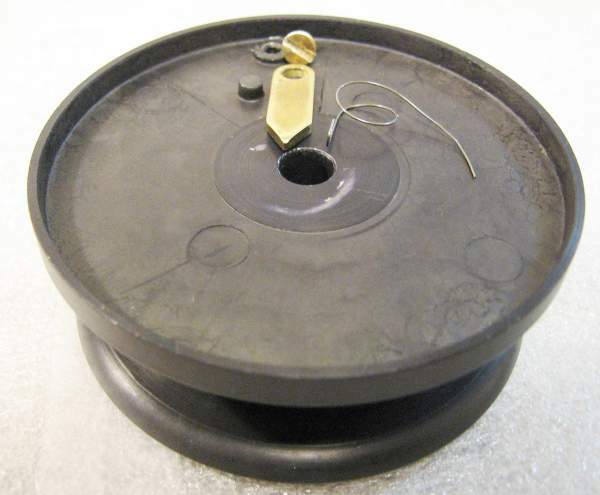 The oscillation block attachment to the main shaft is very interesting on this reel. The back end of the shaft is threaded and the oscillation block is held between two nuts. What makes this so unique is that spool reciprocation can be easily adjusted for perfect line lay. This is the first reel I have seen with that feature. The steel oscillation gear is robust, as is the oscillation arm. Internals are all done so now it's time to install the bail, line roller, under spool felt washer and side plate. Notice the screw & nut on the side plate and the rounded end stud in the center of the small oscillation gear. 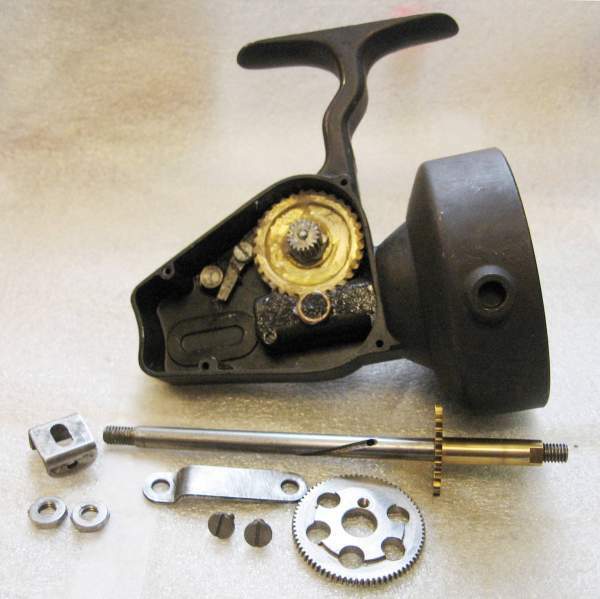 The small screw can be adjusted so that it rides against the ball on the main gear so that there is no side movement in the main gear. That is an interesting and unique feature. 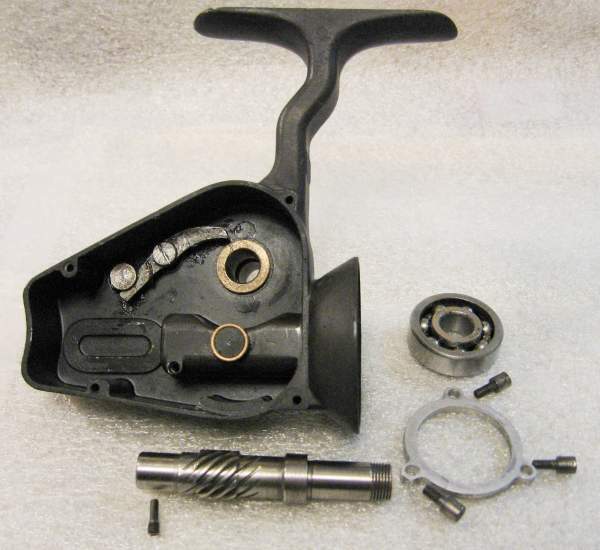 It's time to adjust the main gear and tighten the lock nuts, install the handle knob (I use ArmorAll here, too), install the handle, spool and drag knob. Also, notice there's a screw on the main shaft housing to oil the main shaft. Well the beast is all back together, cleaned up nicely considering all the goo inside, looking pretty darn good, IMHO, and works like new! This is one of, if not, the heaviest built reels I've ever dis and reassembled. Old time quality and engineering at its finest, that's for sure. Did you keep that goo to patch roof in event of an errant hurricane??? Great job, I love seeing old dinosaurs come back to life. What a beast! That thing is like Joe's lathe he just got...built for the long haul. Lots of interesting features there, thanks for the look inside Tommy. An amazing reel. I doubt we will ever see a new model ever that even comes close to resembling this one. Great work Tommy - and terrific to see that warhorse get a new lease on life! Great job on showing us what that tank looks like on the inside. Your work is always nice and clean, with great detailed pics. I was hunting these down a while back, but most I’ve seen never looked too good. Maybe some surf fisherman filled it with all that gunk to keep salt water out. I don't, Sal, but there's been a few decent ones with decent prices sell in the last couple of months. Thanks Tommy... couldn’t touch those at that price, but I haven’t been looking until I saw your excellent tutorial. I've used this expression in the past when I've had my mind blowen a little or a lot by a post or a series of posts and there's no more to say... I'll call it my "Dude!" award from now on.